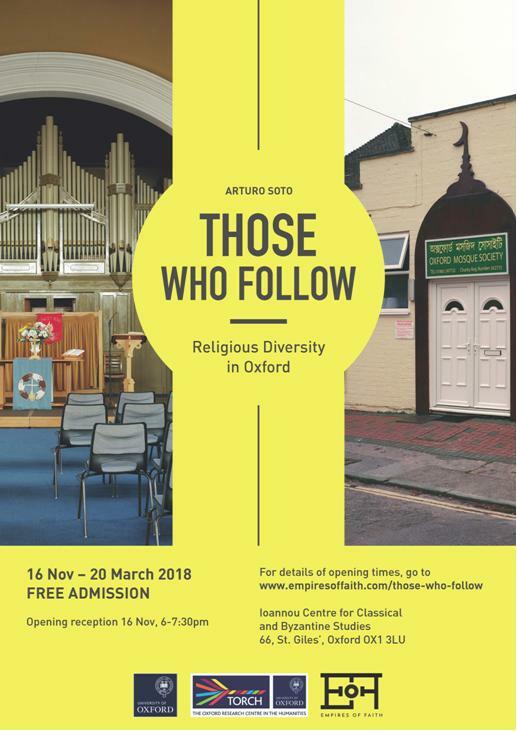 Those Who Follow documents places of worship of Islam, Hinduism, Judaism, Buddhism and Christianity in the greater Oxford area. The series has been made in part as a response to the Imagining the Divine exhibition, and in partnership with the Empires of Faith project and curatorial team. The aim is for it to serve as a contemporary reflection of some of the exhibition’s core themes. The images depict the exterior and interior of modern buildings used for religious practices and celebration in order to see how the architecture and organisation of space reflects the values and beliefs of the religious groups in each case. I am interested in investigating how aesthetic values are used to define or suggest a spiritual dimension through distinct cultures of display, particularly since some religious communities often use nondescript buildings while others have a representative architecture that establishes a visual authority from the outset. Religious buildings are not only important for their congregation, but play a role in shaping their surrounding communities visually and socially. Often, however, people are not aware of what lies behind closed doors. In the same way that portraits make it acceptable for viewers to extend their gaze upon someone’s face to satisfy their curiosity, these pictures give viewers access to spaces they would not normally enter. The work is inscribed in a long tradition of photographic documentation of institutional spaces. I have been particularly influenced by artists such as Lynne Cohen, Thomas Struth and Mitch Epstein, whose subjective accounts offer a complex view on the ambivalence inherent in institutional space. You can find out more about Arturo and his other work on his website.